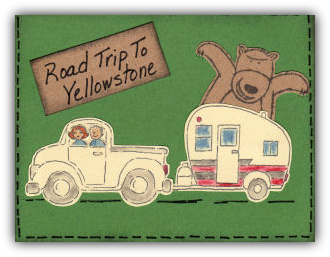 "We spent two nights at your park on our way to Yellowstone this summer. It's a delightful park and everyone was very friendly. My in-laws had stayed there almost 18 years ago and they were very excited that it was still operating. Thank you for a very enjoyable stay over." Summer 2010 - "We 14 riders from Adventure Cycling's 2010 Teton to Tides (Jackson WY to Oregon Coast) self contained bicycle tour group want to thank you for use of your outstanding facility. The tent area, showers, laundry and meeting room met our needs perfectly. I'm sure other touring bicycle groups will find your facilities to their liking for years to come." "BEST RV PARK IN THE COUNTRY"
"Thank you again for a wonderful time in Baker City... You know how to entertain the RV's. Try not to work too hard and enjoy yourself... Thank you again." 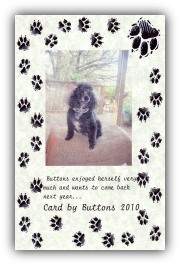 "Buttons enjoyed herself very much and wants to come back next year...."
September 2010 - "Thank you so much for hosting the Family Motor Coach Assoc. joint rally for 3 chapters in September. The hospitality was unbelievable. We could not have made a better choice as to our venue or the endless sightseeing and recreational opportunities in your beautiful area. Our membership were equally impressed and are talking about a future return to Baker City for another joint rally. Your facilities, hospitality, flexibility and professionalism were top notch, and made planning and carrying out the rally a real pleasure. I will highly recommend your facility to anyone seeking an excellent place to spend an evening, a week, or to plan a joint rally. We appreciated the mature landscaping, the rustic (yet modern) clubhouse, the facilities and the ability to place all our attending coaches in close proximity to each other. Baker City is an exceptionally friendly town with merchants more than willing the local history and make recommendations. So, THANK YOU until we see you next time." July 2011 - "HI I spent this last weekend at your park and I would come back again. Everyone was so nice and the park was beautiful lots of shade trees and very accommodating. Thank you for my first rv trip in my new rv. I was in space 112." July 2011 - "Lori and I would just like to thank you for your friendly hospitality towards our family when we stayed at your park & experienced a break down with our pull vehicle as we arrived in Baker City. We were weary from the long time on the road and the break down was an added stress. You offered to drive Lori and the kids to the museum and were so accomodating to us. We are very gratefull for the kindness you showed. Your kindness in Baker City will be a lifetime memory. July 2011 - "Loved the hot showers, the store that I used often and the friendly service from all. Katie (the cat) is a great host and kept us greatly entertained! 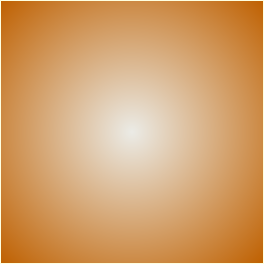 Would recommend to others and hope to be back!" August 2012 - "Found this park last summer. Can not say enough about it. Beautiful clean bathrooms/showers. Large clean laundry facilities. Fun store to poke around in (surprising what you can find). Huge invigorating Spa for after your long drive. Easy access from I-84 and very quiet. Oh yeah, everyone is very friendly too. Can hardly wait to come back every summer." April 2013 - "My wife & I just wanted to say how much we enjoyed staying at your park this past week. We were in space 121. It was very relaxing, and a great trip down memory lane. We wish you continued success. As you know, we had some time to explore Baker City and thanks to your ideas, we loved seeing the Interpretive Center and the historic downtown walking tour. We were also the ones who had RV troubles and had to wait for parts. We used Gene's Truck & Trailer Repair, LLC, and I mentioned that I would let you know how things worked out. Well, we are home safe & sound and that's because of Gene. He delivered on time & on budget ... actually he was faster than expected because he worked long hours as he knew we were "stranded" and anxious to get home. If you have anyone needing RV repairs, we would definitely recommend him. Thank you again for making a "tough" situation so enjoyable. We definitely hope to get back!" May 2013 - "We made it to the small town of Baker City, OR for the Northwest Lazy Daze GTG. It was great fun and I met a lot of new friends there as well as seeing some old friends as well. The weather when we arrived was windy but the second day day was great." Jimbo - See photos of the trip here. April 2014 - "The BEST, cleanest campsite we have been at in 53 days!! Good Luck with your business. 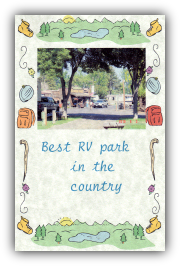 We will be reviewing it on trip advisor and other rv sites!! Thank you so much."